This report aims to provide a "snapshot" or inventory of the state of regulated child care for children with disabilities in Canada. It establishes a baseline for considering issues and progress on inclusion of children with disabilities in regulated child care programs. This is especially important as child care continues to receive relatively limited support in policy development and research even as early childhood education and early learning more broadly has begun to enjoy enhanced recognition and policy support. Although neither Canada as a whole nor individual provinces/territories offer entitlement to service or inclusion for children with disabilities in regulated child care, the child care sector has led the way in early years inclusion in a number of ways. Since the 1980s, community-based child care centres have voluntarily expanded their mandate (often with the support of provincial/territorial funding) to include children with disabilities. 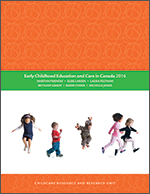 Through the leadership of early childhood advocates, researchers, service providers and policy makers, inclusion in regular child care programs has become accepted "best practice" in Canada, if not necessarily the reality. The report includes as its context an overview that includes both the situation for children with disabilities and regulated child care in Canada. It then presents a review of Canadian literature on child care inclusion of children with disabilities and/or special needs. The concluding discussion focuses on approaches to facilitating inclusion of children with disabilities in regulated child care across provinces/territories and the unmistakable need for a universal, high quality, Canada-wide-and inclusive-early childhood education and child care program in Canada. Information on the details of provincial/territorial programs and policies regarding children with disabilities in regulated child care is included as an Appendix.